While some of these measures might sound daunting, many of these considerations have been well modeled and developed by the coastal engineering sector. The design and assessment of low crested submerged breakwaters (i.e., reefs) is a practice developed over many decades. Coral reef scientists and managers should work together with engineers to deliver better ecological benefits from these projects. Reef morphology: including the shape and slope of the outer fore reef, dimensions of the reef crest and reef flat (length, width), and lagoonal coral heads, patch reefs, and or other formations. Reef width: including the reef crest and associated reef flat. Wider reefs dissipate more wave energy. ref Thus, even narrow reef flats can dissipate much wave energy. Placement on the reef, materials used, and design are critical factors that may impact the effectiveness of substrate structures for coral restoration. To properly design the size and placement of structures, practitioners should work with project partners to obtain detailed assessments of the existing bathymetry and dynamics of water currents around the coral reef. Natural factors may also dictate where structures are placed, such as the geomorphology of available reef habitat or areas where coral recruitment most likely occurs. Natural reefs have a variety of formations and morphologies that create interstitial spaces, nooks, and crannies. These formations increase reef rugosity that reduces wave energy and promotes biological diversity by providing habitat to smaller species. The design and shape of structures should attempt to mimic natural reef formations. One way to achieve this naturally is to outplant coral fragments directly onto artificial structures. 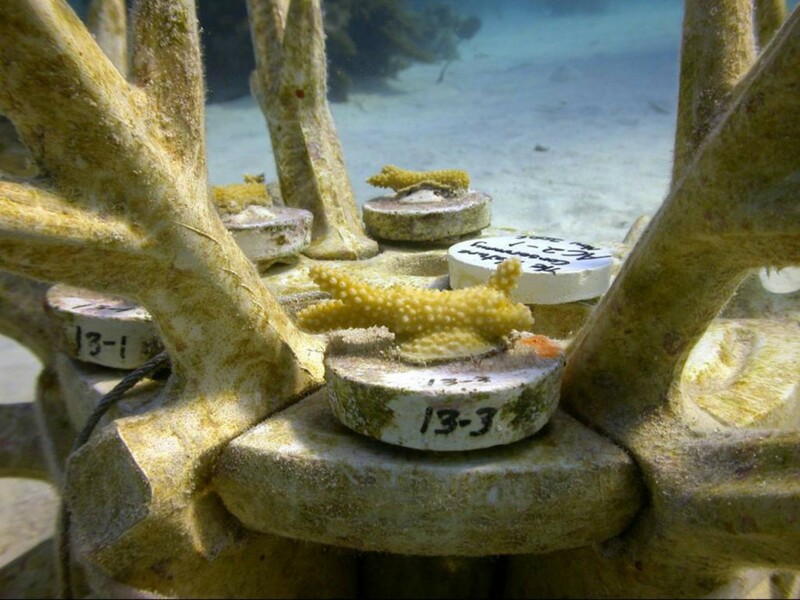 Although these structures are increasingly being used in a variety of coral restoration projects, few studies have been done to test their use and effectiveness in promoting coastal defense. However, The Nature Conservancy is currently working in Grenada on a pilot project that tests submerged artificial structures in a shallow, high-energy coral reef environment and will assess the ability of structures to colonize coral reef organisms and buffer wave energy. Artificial structure projects require detailed planning and should incorporate professional expertise in their design and construction. Transplanting live coral fragments back to the breakwater structure after construction may speed up the colonization process and promote ecological restoration. Materials should include natural products that increase interstitial spaces to promote colonization of corals and provide habitat for reef organisms. Structures created to mimic the natural profile, shape, and materials of coral reefs may better promote ecological restoration. Large coral formations growing on the reef surface create the greatest friction and are the most important for wave attenuation, so it is important to protect existing corals and mimic natural corals in structural restoration projects. Reefs should not be restored in “novel” areas. If reefs did not previously occur in an area, they likely will not survive there now. Poorly conceived projects fail to meet goals, can create hazards, and make it harder to execute well designed projects later. Active restoration must be combined with holistic management efforts (e.g., including maintaining water quality, controlling overfishing, and habitat protection) for long-term restoration success of degraded reefs. Cultural values and local input should be incorporated into restoration design principles. Lessons from mangrove restoration efforts show how local observations of habitat loss and flooding risk were more important than scientific/economic data in driving policy changes to support their protection/restoration. Reef restoration for coastal protection is likely to be more cost-effective in areas with high coastal population/high-valued infrastructure along with coastline value.